Ms. Rachel is showing the finished product with no border, which looks good. I am just a BIG quilt lover. We shall see what I finally decide to do in the next few weeks. I will be assembling these blocks into the top this week. I would like to thank Tracey of traceyjayquilts for mentioning me in her WIP Wednesday posting. It is nice to talk to other quilters, even though you may never meet, and find out that you have the same thoughts, isn't it? BTW, has anyone else noticed the freakish number of Wendys making quilts and blogging about it? When I was in school there was only one other Wendy in all 12 years. Now they are everywhere. I think the baby name books need to change the definition of Wendy to quilter. Don't you? There also seem to be a LOT of Lauries. My aunt is one of them. 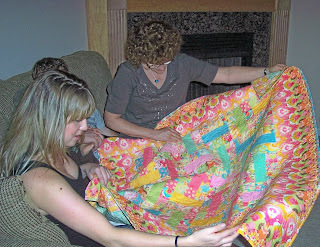 She's a quilter, and I have seen many Laurie quilters in my blog reading. This is my latest music discovery. I was channel surfing in my car and heard this. Liked it so much I bought the cd that night. Usually I don't buy a cd based on one song, but I am not sorry at all. Check it out! Its pretty cold all over the States, so I hope you are staying warm and healthy. Viruses and infections are taking people out left and right around here and we don't even have snow! Be safe and keep sewing! I'm glad YOU did all those little pieces!! 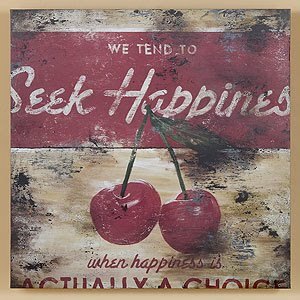 I think a "happy," big print or border fabric would make a nice finish for it, with a narrow inner border first. You'll find just the right one for it -- your matches are always spectacular! P.S. I LOVE The Afters! That song is truth set to music! Since I found out I am going to be a grandma in July, baby quilts have been on my mind. Love the bright colors in the Swanky quilt above. I have some fatquarters of Central Park and am dithering over what pattern would be good to use. The postage stamp quilt looks darling.